The church has a contemporary service followed by a traditional one; we attend both. A Lutheran congregation, I expect a high-church experience (more formal and liturgical). However, their idea of contemporary is far different from mine. Their music is modern, yet shrouded in formality. Reading from the lectionary, we stand for the third passage, this one from John. After an informational message is “prayers.” The minister concludes each petition with “Lord, in your mercy,” and we add, “Hear our prayer.” Then there’s the offering, and we recite the Lord’s Prayer. For communion there’s no invitation for outsiders to participate, but the usher motions us forward, affirming that communion is open to all. From the bulletin we know the minister will say “May the peace of the Lord be with you always.” Our response is “and also with you.” The “bread” is a thin wafer; dry and flavorless, I struggle to swallow it. Next is the juice, only it’s wine; I’m quite unprepared for it. It wasn’t the soothing sip of grape juice I expected to wash down the crumbs. We return to our seats, sing the final song, and are dismissed. An hour later, we re-enter the sanctuary for the traditional service, receiving a different bulletin. This one is void of lyrics and full of liturgy. We sing hymns from the Lutheran Service Book to organ accompaniment, followed by the same lectionary readings and message. Afterwards we stand to recite the Nicene Creed. Next are the offering, “prayers for the day,” and the Lord’s prayer. For communion, ushers dismiss the congregation by rows and people go forward in groups, kneeling to receive the elements. Some partake individually, some with their row. It’s more solemn than the first service and several people do not participate. 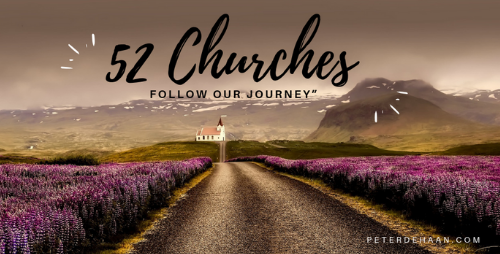 Get your copy of 52 Churches today.